PLATINUM EDITION! SOUTHERN VEHICLE W/EXCELLENT SERVICE HISTORY! 4WD..5.7L V8..JBL AUDIO W/NAVIGATION AND BACK-UP CAMERA..HEATED/COOLED FRONT SEATS..HEATED REAR SEATS..FACTORY REAR DVD ENTERTAINMENT..POWER LIFTGATE..POWER FOLDING 3RD ROW..REAR CAPTAINS CHAIRS W/CENTER CONSOLE..REAR AIR AND AUDIO..POWER SUNROOF..PARK ASSIST..REAR GLASS SUNSHADES..LASER GUIDED CRUISE CONTROL..WOODGRAIN TRIM THROUGHOUT..REAR SIDE CURTAIN AIRBAGS..BLUETOOTH CONNECTIVITY..CD PLAYER..SATELLITE RADIO..POWER EVERYTHING..FACTORY 20" WHEELS..ROOF RACK..STEP BARS..NON-SMOKERS VEHICLE! PRISTINE BLACK EXTERIOR WITH TAN LEATHER INTERIOR. 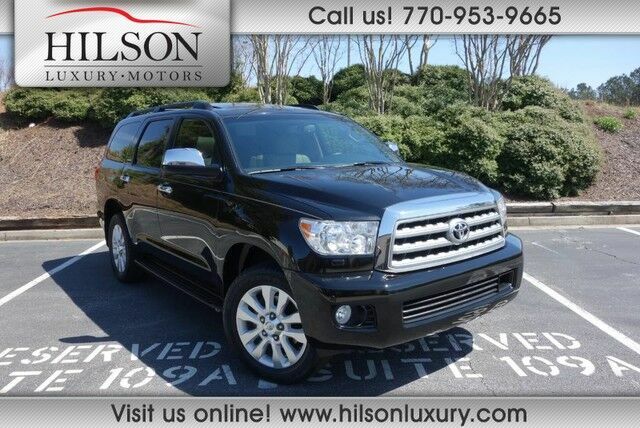 THIS SEQUOIA HAS BEEN MECHANICALLY INSPECTED/SERVICED UPON ITS ARRIVAL AND IS CURRENT ON ALL SERVICES AT THIS TIME..THE EXCELLENT SERVICE HISTORY CAN BE SEEN BY CLICKING ON THE FREE CARFAX ICON ATTACHED TO THIS AD..THIS SEQUOIA IS IN EXCELLENT CONDITION INSIDE/OUT AND WAS VERY WELL TAKEN CARE OF..THIS IS NOT YOUR TYPICAL NEW CAR DEALER TRADE. YOU WILL NOT FIND A NICER SEQUOIA ON THE MARKET! ALL OF OUR INVENTORY AT HILSON MOTORS IS AUTOCHECK/CARFAX CERTIFIED..SAVE SOME TIME AND VISIT US FIRST FOR A HIGH QUALITY VEHICLE AT A VERY REASONABLE PRICE!! HERE AT HILSON MOTORS WE ARE A NO HAGGLE NO PRESSURE OWNER OPERATED SMALL BUSINESS THAT STRIVES FOR QUALITY INVENTORY AND EXCEPTIONAL CUSTOMER SERVICE..HILSON LUXURY MOTORS IS BBB ACCREDITED AND ENCOURAGES YOU TO CHECK OUR ONLINE REPUTATION..COME SEE THIS PLATINUM SEQUOIA IN OUR 6000 SQFT INDOOR SHOWROOM RAIN OR SHINE..WE OFFER COMPETITIVE FINANCING RATES AND A RANGE OF EXTENDED WARRANTY/GAP PROTECTION PROGRAMS..WE GLADLY ACCEPT TRADE INS!! PLEASE CALL WITH ANY QUESTIONS 770-953-9665..